When deciding to make that next big mower purchase, many people like to do research before jumping in the water. We wouldn’t expect anything different from our future customers. Spartan Mowers has now made researching, creating, and purchasing a new mower easier than ever with a website that has been revamped from top to bottom. Spartan Mowers has gone through and made sure that the Mowers pages and specifications section on our products is easy to find and easy to navigate. A click of the “Model Overview” tab will give you a brief breakdown of how our mowers ride, type of cut, specs on the frame, and our overall design. Take a step further by clicking on the “Specifications” tab. This will tell you everything you want to know in an easy to read chart about the frame and series of your choice. It’s one thing to read all about a product, but it’s a whole new ball game to see that product in action. That’s why Spartan Mowers has added new photos and videos to help you get a better feel for our products. Get up close and personal with our Mower 360 feature. 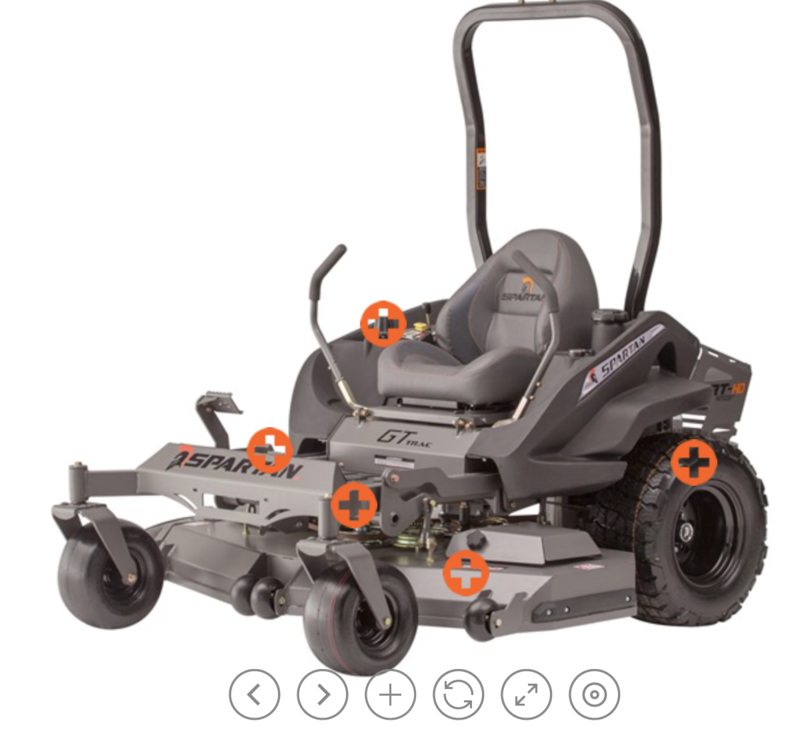 Mower 360 allows you to view the selected mower with just a click of the mouse…360 degrees. You can even zoom in or make the image full-screen in order to get a better look. Certain features, such as the turn dial height control and radial tires, have been given extra attention. A quick hover over the orange buttons gives you a zoomed in view with a short description of each feature. Yes, you read that correctly. How cool would it be to build your own Spartan Mower? One of the newest features to our website allows you to do just that… BUILD YOUR OWN MOWER! Step 1: Begin by choosing your frame (RT or SRT). A full description of each frame is displayed below the mower. Step 2: Then, it’s time to choose your series. The RT frame provides a choice of PRO or HD. The SRT frame provides a choice of PRO, HD, or XD. Step 3: Next, choose what motor and deck size to add. Step 4: The fun really starts on this page as you choose from an assortment of accessories, from an electric actuating deck lift to solid front tires. Step 5: Finally, view the overview of your new custom mower. Here you have the option to make changes, print the specs out so you can compare, and send in your information for a custom quote from a dealer near you! Great customer service is the cornerstone of any successful business. At Spartan Mowers, we care about what you, our present and future customers, have to say. That’s why we have made it easier for Spartan customers to submit a review. With just the click of a button, an easy form pops up with a small number of fields to fill out. It’s really easy, and we love all the positive reviews coming in. If you are still on the fence about Spartan Mowers, check our Facebook page to see what other people are saying. A quick browse through Spartan’s website will have you saying, “I WANT THAT!” And with Father’s Day just around the corner, it’s time to get in gear to find the perfect gift for the #1 dad in your life. Without a doubt, a Spartan Mower will make life a little easier on dear old dad just in time for the prime grass-cutting season. Download our catalog or find a dealer near you to begin your Spartan Mowers journey today!